We all have a favorite wine. Something that is associated with an event or a time in our life. It may not be the best wine, but a single sip brings to mind memories of a great experience or special person. Refosco dal Peduncolo Rosso by Ronchi di Cialla is that wine for me. It was the first serious wine Raffaella and I consumed together. We were not rolling in the money at that time but we had decided to buy this Friuli wine to enjoy together. I remember the first bottle cost 58,000 lira, much more than we could really afford for a wine. Raffaella prepared a Risotto ai Funghi Porcini and we enjoyed our dinner, our wine and our budding relationship. Over the following years it has always remained forefront in our list of favorites and generally always available in our cellar. Ronchi di Cialla is a company that represents the passion of Italian winemakers. 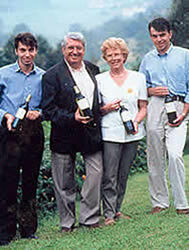 Ronchi di Cialla was established in the late 60s when Paola and Dina Rapuzzi decide to sell their family business and move to the Friulano countryside. Paolo is fixated with his dream: to make wine in the traditional Friulano method. This was a time when the international vines were expanding in Italy. Heirlooms wines were passe’. The larger producers were introducing vines that were more robust and methods designed to increase their annual production. The Rapuzzi’s vision was that quality would prevail over time. Paolo studied the ancient texts and began planting both vines and areas that were abandoned by the more commercial vineyards. Their vision was right on and Ronchi di Cialla has become one of the premier producers of some of the most exclusive wines of Collio. I am glad the Rapuzzi’s had the vision and the strength to go against the masses. I cannot imagine a world without Picolit, Tocai Friulano, Ribolla Gialla, Schioppettino, Verduzzo Friulano or Refosco. Refosco is not a wine for everyone. It is a complex wine and structured wine with pronounced flavors with a residual of tannins. To the nose, an intense bouquet of liquorices, blackberry and spices. To the taste, Refosco is complex and structured wine with tones of wild blackberry, violet and cloves. Refosco also has a distinct flavor of the minerals in the hills of collio that persists during the entire meal. The wine is aged over four years before release. This wine is perfect for the aged cheeses and wild game and fowl. The extra time and care is evident in the balance of the Refosco. Not a wine for everyone and not a wine for every meal but Refosco del Peduncolo Rosso by Ronchi di Ciallas is a wine of special occasions to be remembered and cherished over time. 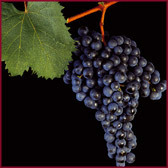 Grape: Refosco dal Peduncolo Rosso100%. Bouquet: Mature red Fruits, Leather, Espresso and a hint of Minerals. Flavor: Blackberry, liquorices, violets and cloves. Good balance and structure with a lasting taste of minerals. Decanting: at least ½ hour. Pouring: Pour slowly, angle at 55 degrees or less. Glass: Wide-bellied Red Wine Glass. Aging: This wine is released 48 months after harvest. It reaches maturity 5-7 years after harvest and will maintain its high quality at least 20 years and perhaps longer. David, I am glad that you picked up my comment on your blog. I really do think that you run the most mouth watering blog for anyone interested in Italy. Jim Thanks for the compliment! I try evidence the good things that I believe are valuable to others! I follow your thoughts on professional life.